Email Spam Identification, category classification of news and organization of web pages by search engines are the modern world examples for document classification. It is a technique to systematically classify a text document in one of the fixed category, or In other words, tagging of a text document can be described as document classification process. This technique is really helpful when the amount of data is too large, especially for organizing, information filtering, and storage purposes. In this article, we will discuss an approach to implement an end to end document classification pipeline using Apache Spark, and we will use Scala as the core programming language. Apache Spark is the ideal choice while dealing with a greater volume and variety of data. Apache Spark’s machine learning library – Mllib is scalable, easy to deploy and is hundred times faster than MapReduce operations. The first component of the pipeline in is a pre-processing block which involves removal of noisy content from the document. This included cleaning of URLs, punctuations, digits, short words, extra whitespace, and English stopwords etc. Below are the scala utility functions used for cleaning various regular expressions and custom words. Now, we need to load the documents and create a data frame using SQL context and splitting it into test data and training data frames. This will include reading the text file (containing the documents), creating file RDD to the data frame and finally slicing the data frame into training and test. Logistic Regression Component – For classification component, we will use logistic regression. When the problem is multi-class classification, we will wrap the model in one vs. rest model. Creating the final pipeline of all the components, and fitting the model to training data. 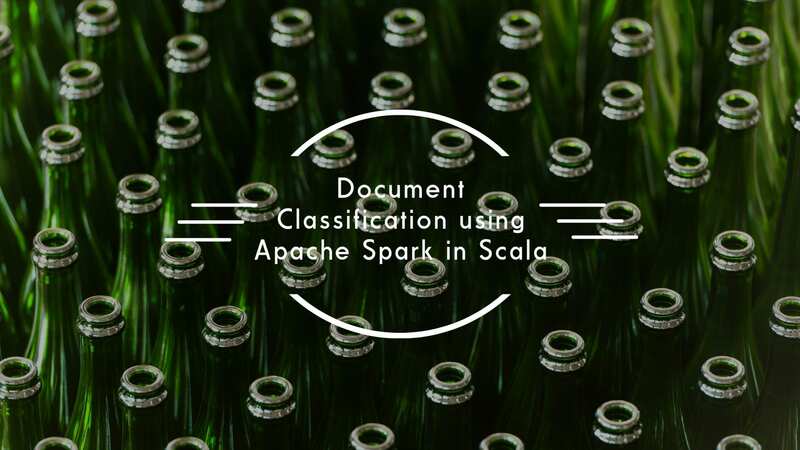 The full code of this tutorial can be found here, This tutorial explains about creating a pipeline for document classification in spark using scala. This end to end pipeline is capable of predicting the unknown classes of different text with decent accuracies. Next Steps are obviously about the improvement of each component involved in this pipeline. Refer to the official MLlib Link and Spark programming Guide for more detailed documentation. Feel free to share your thoughts in the comments.